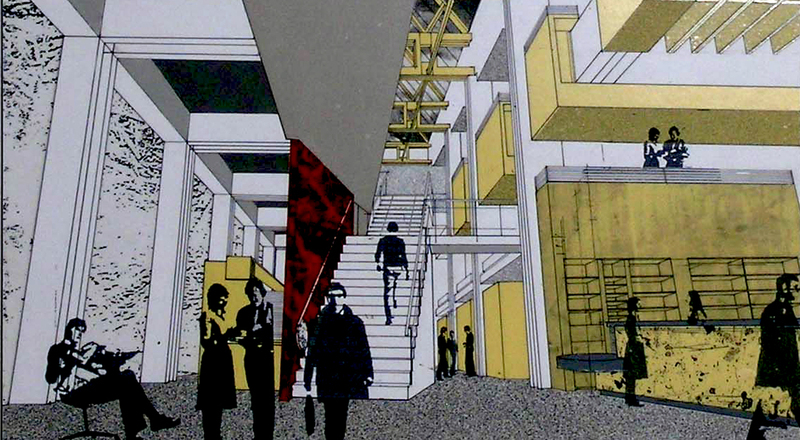 The architectural competition for the relocation of the Bibliothèque d'Outremont was launched in 1994 in order to reply to the aspirations of this community. The Montreal City Council decided to promote this competition, whose foremost objective was to relocate the library, previously situated on Davaar Street, to a new location in close proximity to the Outremont City Hall. The library was to receive new facilities responding more adequately to its actual needs. The project's specific requirements were numerous and included; the need of additional space to accommodate a larger volume of documents and a diversified clientele, computer access for both employees and users and a design strategy capable of anticipating the expansion of services offered. The architectural concept of all competitors had to consider two different realities of a library; its animated cultural vocation juxtaposed with study areas requiring silence and limited distraction. In addition, all projects had to consider numerous programmatic requirements that included; creation of spaces easily-identifiable by users, the use and control of natural light in reading spaces, flexibility of certain rooms, noise-control during internal consultation, accessibility of the building and its services and finally, design of an exterior landscaped public space. The new building would permit the addition of 12,000 titles to the library's collection, provide reading spaces, a children's area and a consultation area adapted to new technologies. The Galerie d'art d'Outremont would also be situated inside this new building.